[15:29:57] [King Blackthorn]: I believe it is time to begin. [15:30:20] [King Blackthorn]: Thank you to those who have made time in their busy scheudles today. [15:30:34] [King Blackthorn]: though I am saddened to see four towns unrepresented. [15:31:32] [King Blackthorn]: We have a good bit to cover today so let us begin. [15:31:53] [King Blackthorn]: First off, as many of you have noticed, there have been a few changes here since our last meeting. [15:32:28] [King Blackthorn]: The chair for the Governor of Bucanneer’s Den has been removed and they are no longer represented on the council. [15:32:51] [King Blackthorn]: The treachery of Governor Marcus Rotgut was revealed to all. [15:33:01] [King Blackthorn]: The theft of the world-gem. [15:33:12] [King Blackthorn]: The revelation that he was the reviled Shadow himself. [15:33:40] [King Blackthorn]: all eventually led to his own death at the hands of the Demon’s he played with. [15:34:12] [King Blackthorn]: Due to the theft here of all places, I have requested that a portion of the King’s Guard be reassigned to this council. [15:34:31] [King Blackthorn]: they will stand guard here to protect the chambers and items within. [15:35:06] [King Blackthorn]: It is with regret that I have learned that the people of Bucaneer’s Den are happy to be free of the crown again. [15:35:29] [King Blackthorn]: it seems their membership here was only to learn more of us to take advantage of us. [15:35:52] [King Blackthorn]: But now, that is all in the past. [15:36:33] [King Blackthorn]: and we are left with the physical representations of the Virtuous Principles corrupted. [15:37:32] [King Blackthorn]: Now, it is up to us to determine how to cleanse the Bell, the Book, and the Candle. [15:38:04] [King Blackthorn]: I have put some research into it, but alas I have not found a solution as of yet. 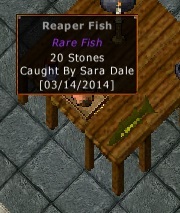 [15:38:29] [King Blackthorn]: The next item pending is the King’s Contest. [15:38:49] [King Blackthorn]: I believe that the current standings put Lady Sara Dale in the lead for the grand prize. 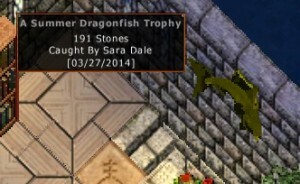 [15:39:53] [King Blackthorn]: Lady Dale has submitted a 191 stone Summer Dragonfish. [15:40:53] [King Blackthorn]: The smallest fish is a 7 stone fish caught by Sir Malloc. [15:41:05] [York]: was it cute? [15:41:08] [The Gooch]: very impressive none the less! [15:41:35] [King Blackthorn]: and the Largest Crab or Lobster is a rare Blue Lobster submitted by Garfield. [15:42:12] [King Blackthorn]: by Midnight US Eastern Time. [15:42:48] [King Blackthorn]: I have been notified that the magics used to build Castle Blackthorn may prevent the winner from being displayed there. [15:43:05] [King Blackthorn]: if that is the case, then the winner will be displayed here in the Governor’s Council Chambers. [15:43:14] [Sara Dale]: What about the awards house? [15:43:29] [King Blackthorn]: but every effort will be made to display it in the castle if it is possible. [15:44:05] [King Blackthorn]: My intent is for the Awards house to be the final display place after a reasonable time at the castle or here. 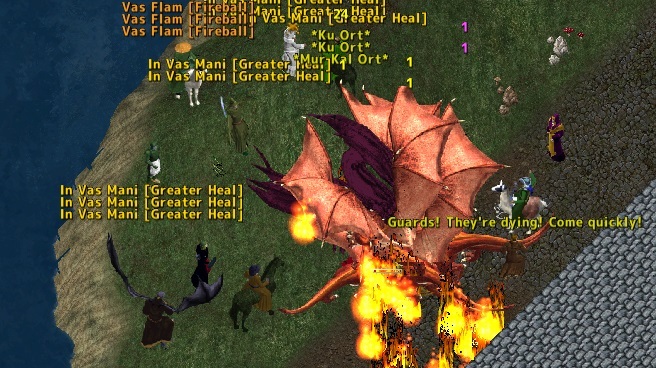 [15:44:23] [King Blackthorn]: I hope everyone has enjoyed the contest. [15:44:57] [King Blackthorn]: And now, let us hear from our Governors and learn of our cities. [15:45:14] [King Blackthorn]: Lord York? Are you settled into your new home? [15:45:43] [York]: Would you like me to speak first? [15:46:12] [York]: Upon arrival in Skara Brae I could not help but notice signs of a rift in the citizens. [15:46:20] [York]: This is not too surprising since there has been a lack of direction for a short time. [15:47:16] [York]: willing to strike down a threat to the town. [15:47:47] [York]: the most passionate and spiritual. [15:47:56] [York]: It will be a great honor to serve this community. 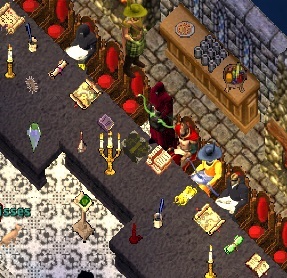 [15:48:11] [York]: A trade deal with the Bardic Collegium allowing citizen to benefit from a faster casting bonus. 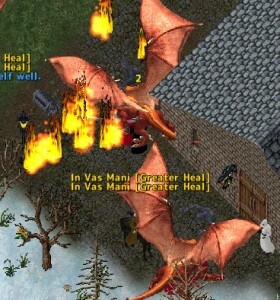 [15:48:34] [York]: This was provided by a few players, mainly Hoffs, Spargo, Tina Tink, and Skara’s budget. [15:48:56] [York]: but the citizens support them and I will do as they wish. [15:49:12] [York]: to help encourage general use items to be stocked at a fair price. [15:49:21] [York]: This includes subsidizing vendors and funding upcoming merchants (resource gathers). [15:49:28] [York]: A promo is being put together so citizens can easily find these vendors. [15:49:40] [York]: the matter of acknowledging the settlement of Gilfane. [15:50:18] [King Blackthorn]: I am quite frustrated that the monument for Gilfane has not been completed as of yet. [15:50:31] [King Blackthorn]: I have learned not to pay the contractors in advance again. [15:51:03] [King Blackthorn]: I shall continue efforts there to see that it is eventually completed. [15:51:16] [King Blackthorn]: as well as the one for Barter Town. [15:51:39] [King Blackthorn]: For Barter Town, the requested trees are growing nicely, but are not yet ready for planting at their permanent home. 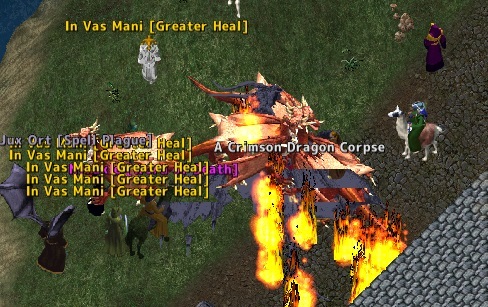 [15:51:55] [Ladra]: yes, we want a big one! [15:52:09] [King Blackthorn]: Lady Kattasrophe? How fares Moonglow? [15:52:28] [Luka Melehan]: *whispers* trees? [15:53:39] [Kattasrophe]: Who have given me the oppertunity to be their Governor. [15:53:55] [Kattasrophe]: I have enjoyed being here for them. [15:54:13] [Kattasrophe]: The citizens of Moonglow have donated generously this Month. [15:56:26] [Flair]: You feel sober. [15:57:27] [Kattasrophe]: Everyone is welcome to come and join the fun. [15:57:58] [Kattasrophe]: there is no animals in there. [15:58:41] [Fat Cat]: no animals? [15:58:42] [Talia]: They’re part of our economy! [15:59:27] [Kelmo]: weasels and such? [15:59:30] [aulbrey]: wait i gotta share? [15:59:38] [Kattasrophe]: anything you would like to see in there. [15:59:55] [Kelmo]: I saw a weasel! [16:00:09] [aulbrey]: can we put husbands in the zoo? [16:00:16] [Fat Cat]: will there be tuna there? [16:00:31] [Kattasrophe]: hmm Aulbrey I dont think that would be very wise. [16:01:01] [King Blackthorn]: Lord Kelmo? What can you tell us of Trinsic? [16:01:53] [Kelmo]: Hail Gov’ners, Citizens, friends and the rest of you too! [16:02:25] [Kelmo]: As you well know there is a wrecked building in the center of Trinsic. [16:02:46] [King Blackthorn]: Someday I hope to learn the story of that building. [16:03:22] [Fat Cat]: it got raided by tons of monsters! [16:06:42] [Kelmo]: lawless gangs… the lot of ’em. [16:06:51] [Kelmo]: The trade unions are entirely over priced for the few meager incentives offered. [16:06:59] [Kelmo]: For the “tributes” demanded by the unions they should at least be worth while and better yet, assist in gathering the taxes. [16:07:31] [Kelmo]: Perhaps the unions could provide us with better incentives and some town vendors. [16:08:53] [King Blackthorn]: Thank you Lord Kelmo. [16:09:19] [King Blackthorn]: I do agree that the rogues roaming the lands have caused some distress. [16:09:33] [King Blackthorn]: and yet, that is a part of what makes this land what it is. [16:09:40] [King Blackthorn]: A balance of Order and Chaos. [16:09:54] [Talia]: who doesn’t like a little distress? [16:10:24] [King Blackthorn]: I believe that you are most suited to assist in combatting these rogues. [16:11:32] [King Blackthorn]: For the rest, be it known that the system and tools of governors is still new and growing. [16:11:57] [King Blackthorn]: I hope that some or all of these suggestions will come at a future date, but when that may be I am not certain at this time. [16:12:21] [aulbrey]: Hey everyone. Listen to my song! [16:12:30] [York]: your… cat… katt..
[16:12:34] [King Blackthorn]: Is no one here to speak for the capital city? [16:13:30] [York]: in the fair town of brit..
[16:14:01] [King Blackthorn]: Lord Gooch. How fares Minoc and the suburb of Bartertown? [16:14:15] [The Gooch]: Hail citizens! [16:18:16] [York]: donations.. is that what they call it these days. [16:19:16] [King Blackthorn]: Thank you Lord Gooch. [16:19:24] [King Blackthorn]: I look forward to hearing more of your progress. [16:19:49] [King Blackthorn]: Lord Ironfish? Doth New Magincia fare well? [16:19:50] [York]: Good job gooch. [16:22:54] [Fat Cat]: i just want tuna…. [16:23:54] [King Blackthorn]: Thank you Lord Ironfist. [16:24:24] [King Blackthorn]: What you requested there sounds very nice, but it is well beyond what a King can provide and is akin to asking for nature to change the seasons. [16:24:44] [King Blackthorn]: and yet, I shall pass the suggestion up to the Goddess and Gods above. [16:25:01] [Fat Cat]: awes black thorn!!! [16:25:21] [King Blackthorn]: And now, does anyone from the citizenry wish to speak? [16:25:55] [King Blackthorn]: Please approach the podium, but chose your words wisely. [16:26:12] [aulbrey]: i gotta be wise? [16:26:30] [aulbrey]: will you marry me? [16:26:51] [King Blackthorn]: I understood you were already bethrothed to one Ug Rankbreath? [16:27:12] [The Gooch]: atta boy, Kingster! [16:27:43] [King Blackthorn]: Are there others? [16:28:12] [Talia]: dont kick the cat tjlo! [16:28:17] [Ladra]: kick the cat! [16:28:52] [King Blackthorn]: Welcome. I hope you enjoy your stay here. [16:29:39] [King Blackthorn]: I hereby decree that all Cats in the Kingdom shall be treated with respect and shall be given any spare fish. 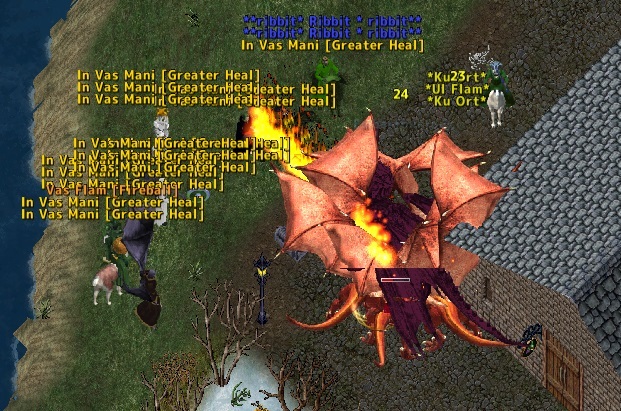 [16:30:03] [King Blackthorn]: Anyone else? 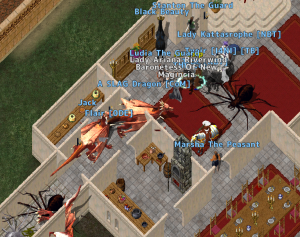 [16:30:08] [King Blackthorn]: Lady Kattasrophe? [16:31:08] [Kattasrophe]: it was the bad who corrupted them. [16:31:23] [Kattasrophe]: So someone pure of heart and is kind should be able to fix it. [16:31:27] [King Blackthorn]: Can there be such a person other than the Avatar himself? [16:31:43] [Kattasrophe]: I do not know. [16:31:47] [Talia]: I recommend Scouring Toxin! [16:32:05] [King Blackthorn]: That it does. [16:32:21] [King Blackthorn]: Is there no one to speak for Jhelom today? [16:32:28] [King Blackthorn]: I understand that Sam had a conflict. [16:33:14] [King Blackthorn]: As a last order of business, we have two empty Governor’s Chairs this term. [16:33:35] [King Blackthorn]: Lady Samantha is missed. [16:33:54] [King Blackthorn]: I would ask that our current governors submit nominations to fill these vacant seats. [16:34:32] [King Blackthorn]: Eli Cross? I do not believe that I know him. [16:34:49] [Kattasrophe]: the one I had mentioned in my report. [16:34:51] [King Blackthorn]: Is he here today? [16:34:53] [Morgan Ironfist]: I would suggest Becca to speak for Yew since she is living close by and knows the people’s needs!? [16:34:59] [Kattasrophe]: he is not. [16:35:18] [King Blackthorn]: Who would speak for Eli as to why he would make a good governor? [16:35:43] [King Blackthorn]: You already spoke on his behalf Lady Kattasrope. [16:35:49] [King Blackthorn]: I am hoping for a second? [16:36:24] [Talia]: did you just say….. eventainment? [16:36:33] [King Blackthorn]: The motion has been made to install Eli Cross as Governor of Vesper. [16:36:41] [King Blackthorn]: Governors? How do you vote? [16:36:46] [King Blackthorn]: we have 3 for? [16:37:06] [Shayla Keylley]: Should a public notice be posted? [16:37:41] [Ladra]: that cat is chasing my rat, kill it! [16:38:03] [Fat Cat]: dem fightin words! [16:38:09] [King Blackthorn]: Lord Ironfist? Have you any thoughts on adding Eli Cross to this council? [16:38:46] [King Blackthorn]: and Lord Kelmo? You have abstained? [16:39:34] [King Blackthorn]: Then by a vote of 4 with one abstaining and two absent, the motion is carried. [16:39:46] [King Blackthorn]: Governor Cross shall be installed in Vesper. [16:40:01] [King Blackthorn]: I belive Becca’s name was presented for Yew? [16:40:09] [King Blackthorn]: Is Lady Becca here today? [16:40:23] [Kattasrophe]: She did show intrest in running. [16:40:28] [Hoffs]: I somewhat doubt she would be interested. [16:40:33] [Hoffs]: She is not a politician. [16:40:47] [Kelmo]: are we drafting cov’ners now? [16:40:54] [Fat Cat]: dont look at fat cat! [16:40:58] [King Blackthorn]: The best leaders are often not politicians. [16:41:06] [Ladra]: if you can’t be here now, how could you be governor? [16:41:06] [Hoffs]: She is indeed. But not someone who enjoys leadership. [16:41:15] [King Blackthorn]: but she must express the desire to be a governor. [16:41:33] [Flair]: so we should only pick from who is here??? [16:41:54] [York]: So you have anyone in mind? [16:41:55] [Ladra]: yeah, it’s good if you are present at the meetings if you want to be a governor..
[16:42:01] [King Blackthorn]: Are there any other names to put forth? [16:42:21] [Shayla Keylley]: Make a public post mayhaps? [16:42:24] [Luka Melehan]: wait….are we overstepping the election process? [16:43:09] [King Blackthorn]: I’d rather have a governor than an empty seat. [16:43:43] [Flair]: personally i am more worried about places like Brit..
[16:43:51] [King Blackthorn]: I must also say that I regret Lady Hoffs decision to not run for Governor again. [16:44:10] [York]: perhaps she will again..
[16:44:24] [Luka Melehan]: you want to run Flair? for brit? [16:44:49] [Hoffs]: should York ever vacate the seat. [16:45:10] [York]: I will step down after this term. [16:45:24] [King Blackthorn]: As we seem to have no concensus on a Governor for Yew, I will leave it to the governors to submit candidates. [16:45:47] [King Blackthorn]: Speak with your people and see who is loyal to Yew. [16:45:59] [King Blackthorn]: Find out who may be willing. [16:46:10] [King Blackthorn]: and let us discuss it again at the next council meeting. [16:46:29] [Hoffs]: I shall speak with Steven, the brother of former governor Samantha. [16:46:43] [Hoffs]: He expressed a desire to run for Yew. [16:46:43] [King Blackthorn]: then it will be quite easy for them to assume the role officially. [16:46:57] [King Blackthorn]: Thank you Lady Hoffs. [16:47:03] [King Blackthorn]: That is good Information. [16:47:29] [King Blackthorn]: I beleive that is all of our business for today. [16:47:37] [King Blackthorn]: Shall we adjourn? [16:48:04] [King Blackthorn]: Thank you all for attending. 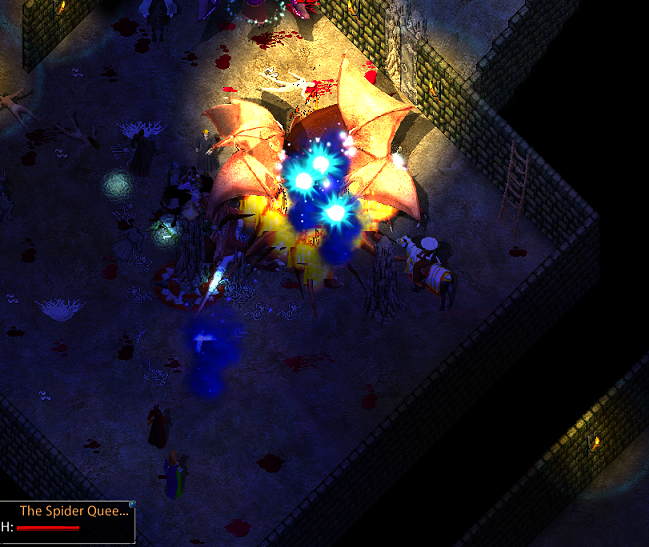 [16:48:08] [Hoffs]: Thank you, Lord Blackthorn. I saw the call come out in general chat for assistance in Britian. 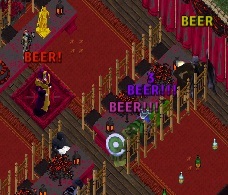 Seems Katt was having trouble at the taverns in town. Now why Katt was at a tavern I am not sure, however she seemed very insistent. I collected my dragon and headed off to Britian to see what the problem was. There was a huge problem. The pubs were under attack!! We defeated these “party poopers” as they were called, only to be greeted by this monstrosity. And finally he was defeated…. Oh did I mention there was one of these for all 4 taverns in Britian. So we saved the taverns and the beer and were however very well rewarded with some good company afterwards!!! A big thanks to EM Troubadour for putting up with all of us on this St. Patricks Day!!! Vladimir, the owner of The Salty Dog in Britain, was looking forward to the upcoming celebration. Holidays were always good for business, but even more enjoyable was spending time with good friends celebrating together. Please join us on March 17th, at 4pm Eastern and 8pm Eastern in the Taverns of Britain for the Celebration. Weeks had passed, and still a raging fire burned within The Lady’s heart. Anger charred her inside. Despite the success in corrupting the Bell, the Book, and the Candle, and despite the theft of the World-Gem, and despite the opening of the door to hell and the summoning of the Greater Demon Arcadian, the final plans had fallen apart. Instead of leading the Demons in conquest, the Demon instead was defeated. How could this have happened! The Anger contained in The Lady exploded forth in a harsh series of curses that blistered the walls of her room. Plans must be changed and a new path must be plotted to keep the people of Britannia distracted, while behind the scenes, things are put back onto the path demanded by the King of Hell. With a smile, The Lady thought of the pending St. Patrick’s Day celebration. The people of Britannia would be gathering in taverns throughout the lands to enjoy the company of friends and drink a toast to spring. What a better time for revenge upon the people of the land? Checking through her own cellar, The Lady selected some of the best cases of liquor and quietly delivered one to each of the Taverns of Britain, the Capital City. The Bell, the Book, and the Candle – The Story of The Shadow so Far…. I, like everyone else on the shard, was trying to piece together the EM story about the Shadow so I thought I’d help everyone out, including myself, and do a bit of a summary of the reports and postings so we could all catch up and follow the plot. The story is actually quite interesting…. Please join me on Saturday, August 17th, at 3pm eastern and/or at 8pm eastern in the EM Hall in Britain. We have received an Emissary who would like to speak with you. That’s when he first appeared – Marcus Rotgut. He brought word of something evil… something lurking in Buc’s Den. A call for aid went out across the lands. Spiders feasted upon any living creature that moved about the island. Citizens were disappearing in the night. The nightmares while awake were worse than those of sleep. Brave warriors answered the call and assembled in Britain where they prepared to aid the town of Buccaneer’s Den. Weapons were sharpened and Shields were readied. Reagents and Potions were gathered and Spells of Power prepared. Arrows and Bandages stockpiled. The assault force gathered before the awaiting moon-gate ready to fight for Honor, Valor, and if necessary, to Sacrifice themselves to save the town-folk. As the first warriors passed into the gate, a scuffle broke out amongst the ranks of warriors and sides were quickly chosen. The slaughter which followed reduced the rescue force to a mere fraction of its former fighting potential. The surviving forces attacked the spiders with determination. After many struggles, they succeeded in clearing the threat from the town. A hurried search of the town revealed a hole in the floor of the home of Marcus Rotgut, Emissary from Buccaneer’s Den. Spider webs lined the tunnels within. Here. The foul spiders must have come from here. First one, then more brave warriors descended into the spiders lair below the town and followed the tunnels to the Nest of the Queen herself. Though the Queen herself was never seen, Nest Guardians defended the future generations of Spiders in the egg-sacks scattered around the nest. 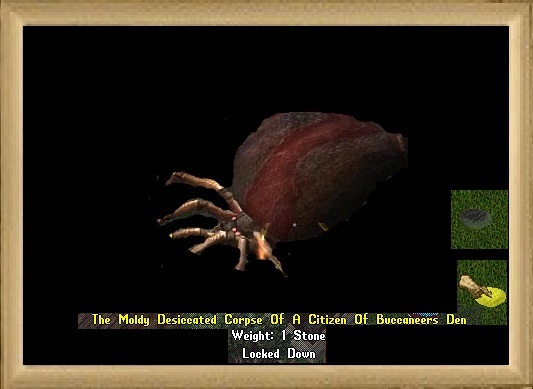 The few remaining captured citizens of Buccaneer’s Den were contained behind webs to await the Queen’s hunger. The brave warriors again fought amongst themselves seemingly over who would be the first to enter and as a result, their force was further devastated and the warriors were never able to harm the Nest Guardians. A few elite warriors bravely fought their way into the nest itself and searched throughout the nest disturbing the webs and cocoons within. Marcus Rotgut stared out from within a cocoon. Nauseous from the spider’s poison and strangled by the clinging webs, he hoped and prayed for rescue. 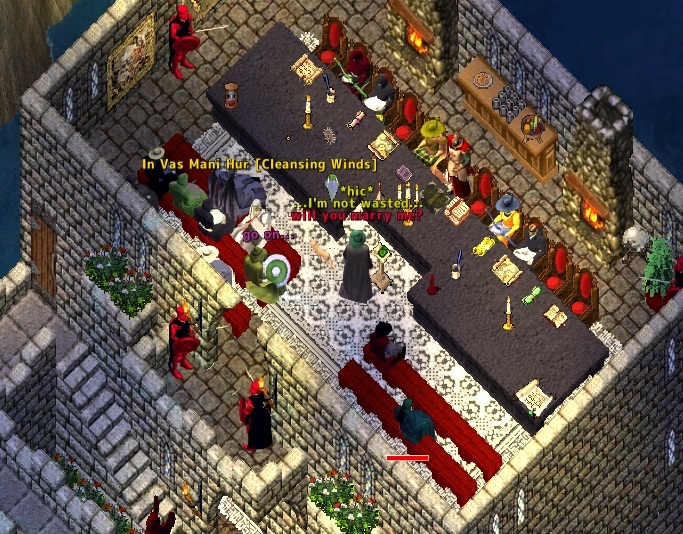 What was shaping up to be a fairly routine meeting of the King’s Council in Serpent’s Hold turned into a shocking one after the people of Buccaneer’s Den apparently ended their decades of lawlessness and rejection of the Crown and petitioned for a seat on the Council. In an address to the assembly, Marcus Rotgut, representative of the people of Buc’s, said that the support (such that there was) from Britannia’s citizens during the recent spider attacks had left a debt of gratitude that needed to be repaid and, in consultation with the town elders, they had decided to seek proper admission to the King’s realm. Rotgut went on to say that his town would swear an oath of fealty in return for a seat on the Council so that they may be fairly represented in deliberations on the realm. There was quite a vocal reaction from some members of the gallery, but mostly on the side of caution. “It’s a trap,” shouted Luka Melehan, a descendant of the famous naval lord, Ackbar. “…we will abide by your wisdom,” responded Rotgut. It was a bright sunny day in the Island City of NuJel’m. A light breeze blowing in off of the ocean cooled the city streets as it passed through with the promise of an end to the Summer’s heat as Fall approached. The prosperous merchants and the well to do dressed in their finery proceeded with stately paces going about their business on the eastern side of the town while their servants scurried home at the end of a long tiring day to their hovels on the western side of the island. In the Palace, a feast was spread for the noble family as they met at the end of the day to plan the upcoming Harvest Festival for the citizens of the Island. Of course, “Citizens” meant those of stature and wealth and not the lowly servants who would instead labor for the Festival. A team of servants was assigned to scrub the Chess Board to prepare for the Festival Match in which the Lord of NuJel’m would accept a challenger from amongst the assembled Nobles to play with Imprisoned Debtors as their playing pieces – each piece to fight for the tile their Lord moved them to – to win their freedom as their Lord won the game, or die fighting for a single white or green square. The Palace Scribes were busy meticulously preparing the invitations to the festival and the Court Chef was reviewing the orders for the wine and exotic foods that would be required. As the late afternoon sun began to fall towards sunset, a shadow appeared to separate from the shadows cast by the walls of the Inn and began to drift slowly towards the palace. Engrossed in his plans, the Lord of NuJel’m never noticed the passing of the Shadow. The Chef in his kitchen felt a chill of a cold breath on his neck and then it was gone. The Head Scribe tried to suppress the shudder that shook his hands causing the golden ink to spill across the embossed invitations. His master would not be happy. As the last rays of daylight shone upon the Palace, the shadowy figure crept into the Gardens and began to chant words of power “Kal Xen In Ex An Sanct” “Kal Xen In Ex An Sanct” “Kan Xen In Ex An Sanct”. At the Shadow’s feet, the earth began writhe and shake as the words of power took effect. The green grass of the Garden began to subside and a sink-hole formed. Darker than the approaching night, the hole grew in both depth and size for a few minutes and then a sudden silence settled in. The Shadowy figure smiled. From within the hole burst forth a giant spider, followed by more and more. Soon the Garden was over-run and the Palace itself was at risk. The Head Scribe was just returning with more parchment when the spiders burst into the library. Scribes are generally not the warrior type so they quickly fell to be webbed into cocoons for the Spider’s feast. The Court Chef heard the screams and knew that help was needed. He fearfully ran across the palace to notify the Lord of NuJel’m. The Lord’s family was quickly evacuated and a call for aid was sent to any who might heed the call. After the Palace was overrun, the spiders settled upon an unsuspecting city, pouncing on citizens and ensnaring them in webs to be dragged off to their lair. The Shadowy figure watched the carnage and knew it was time to move. Reentering the Palace, the Shadow crept through the empty palace to the northern chambers and searched through the Lord’s Chamber removing a few very valuable items. A Gem-Encrusted Map of the Island and the Lord’s Journal quickly disappeared into the depths of the Shadow. Proceeding downstairs into the Vault, the shadow removed The Lord’s crown, the Scepter of the Island and the Lady’s Jeweled Necklace from their protective case and they too vanished into the shadows. Returning to the sink hole, the shadow dropped into the depths and made his escape. After this monster was defeated it didn’t stop there. The Vault of Secrets in Luna has been robbed! The Paladins of the City won’t say what was stolen, but have confirmed a break-in at their most secure vault. A shadowy figure was spotted in the area near the vault. With his prize in hand, the shadow crept through the halls of Luna seeking to make his escape. The alarms were sounding and many people roamed through the area making an escape somewhat challenging. At every turn, another person barred passage. Finally, spotting a chance, the shadow disappeared into a dark corner and vanished. The return trip home aboard the Brigand’s Revenge was a long one. First the main-mast was lost in a nasty storm at sea, and then a dead calm forced the crew to break out the oars as they struggled to move the ship across the leagues toward the island retreat. Exhausted from the efforts, there was a lot of cursing when the Shadow disembarked and ordered the ship back out to sea for repairs at a shipyard. After a long hike across the island, the Shadow quietly left the sun-drenched jungle and entered the cool shadows of the shanty. Quickly, the entrance to the secret passages below were opened and the shadow passed like a wraith through the cavernous tunnels to his home within the earth. His new treasures were added to those from prior heists. Looking over the items left a wry smile on his face. There was so much already accomplished, yet with time so short, there was so much more to do. Reviewing the maps of the lands, potential targets were picked out: Zento and the Empress of Tokuno? Ter-Mur and the Gargoyle Queen? The Librarians at the Lycaeum? Lord Blackthorn in his castle? Or perhaps the petty governors playing at being rulers? The Necromancer’s in Umbra? Lost treasures in Mistas or Montor? The options were many but some were critical to the objective and some merely diversions to distract the pursuit from the real objective. Time is short and priorities must be set. Creeping through the Luna moongate, the Shadow made his way across the lawn to where Santa waited to load his sleigh. Behind Santa’s back, the Shadow hid the packages and gifts in his pack and then slipped away through the moongate. No one saw him except the harpsichord player who sang an appropriate tune. The return trip home aboard the Brigand’s Revenge was again a long one, but one filled with a feeling of elation as the long sought after goal was finally coming to fruition. The Book of Truth was in his hands. Perhaps now she would be pleased. Like a wraith, the shadow crossed the gangplank and the sun-baked sandy beach to disappear into the shadows of the jungle to a little shack amongst the trees and ferns. Fumbling with the latch, the Shadow opened the secret passage and descended into the cool caverns below. The Lady had proven most difficult to please. Flowers withered at her icy touch, a touch that still sent shivers up his back. Bright gems didn’t compare to her cold beauty. Treasures beyond price didn’t satisfy her though they had been provided beyond measure. With a single-mindedness of purpose, she set seemingly impossible challenge after impossible challenge, but each had been overcome. Surely now this latest treasure, the Book of Truth itself would appease her and earn him his just reward. In the rough-hewn passages cobwebs dangled in the faintly moving air, he moved closer to his home. The Lady surely awaited him there. Turning a last corner, a faint light shone ahead welcoming The Shadow to his journey’s end. Within the house, The Lady sensed the return of her plaything. Quickly covering the mirror in the bedroom, she descended the stairs to meet him at the door. One more… just one more she smiled to herself. As he approached the door, it opened and there she stood smiling… a smile that sent a cold fire through him. Quietly, she turned and led him up the stairs to the bedroom past the covered mirror, but she did not stop and continued further up to the 3rd floor. At the top of the stairs, he noticed that many of the treasures were piled haphazardly off to the side of the room. On a central table lay the Candle of Love, the Bell of Courage, and two more empty spaces. Taking the Book of Truth from him, she carefully placed it upon the table. Quickly, the Shadow was ushered out of his own house and sent on his way back the the awaiting ship. Inside the house again, The Lady returned to the bedroom and removed the cloth from the mirror. Deep inside the glass a small flicker of flame and the shadow of smoke could be seen. Taking up a small dagger, The Lady pricked her finger and smeared a drop of blood across the surface of the Mirror. The image within swirled and a grim demonic face appeared. After a long conversation, the Great Demon’s image faded within the mirror leaving only a reflection of The Lady. A Reflection that showed the fangs and horns of her true self. This story was getting very interesting …. The Shadow had managed to steal the bell, the book, and the candle now. The time was right. With the Bell, the Book, and the Candle finally in her grasp, all that remained was to gain the worldgem, and to cast the proper enchantments before the eclipse, to open a doorway between worlds. The foolish Shadow had been tempted and seduced into stealing the required items in exchange for an ethereal ability and the promise of love. A promise that would be broken. Like a broken toy, he would soon be discarded. Climbing the stairs to the treasure room where gold and gems lay scattered across the floor, The Lady approached the table which contained the the three greatest treasures of Britannia. The Bell of Courage, Book of Truth, and the Candle of Love. Taking up the Book of Truth, she hugged it to her breast knowing that the falsehood of who she was would be enough. The Demoness within and the lies she had told soaked into the book leaving it corrupted and sickly looking. With a smile on her face, she placed the Book of Falsehood upon the table. Next she approached the Candle of Love only to see it flare up and reach out to her. Love may love unconditionally, but it seemed to know it’s antithesis. Carefully taking up the candle, she quickly bit into her tongue and spat the blood upon the flame. Hungrily, the flame consumed the blood with an evil hiss, tainting the candle with the hatred that burns in her blood. Quietly, she placed the Candle of Hatred upon the table. Finally, she took up the Bell of Courage and listened to the clear tone that rang from the bell. This one would be easiest of all. In a world filled with mortals, who had not felt fear at the sight of an attacker? Who had not taken cowardly flight at one point or another? Reaching out into the ether, she gathered the cowardice into a pool and dipped the bell into it and watched the bell take on a tarnished hue. As she replaced the bell upon the table, the clank of the clapper upon the bell sounded dull and flat. The Bell of Cowardice, the Book of Falsehood and the Candle of Hatred. Only the Worldgem was lacking now. The Shadow must return with it today. Today was THE DAY. Soon the door between worlds would be opened and the Demon Lords would enter Britannia. With another smile on her face, she descended the stairs to await The Shadow. We were all at the Kings meeting when Marcus stole a world gem from the King and was revealed to be the Shadow!!! That’s when the call went out to the brave warriors of Siege and we chased after the Shadow. After going through a maze of rock we decended upon a house in force. When we got there, Marcus Rotgut lay dead on the floor of the cottage, the bell, book, and candle were corrupted, and we were attacked by the demon Arcadion. After we defeated him, we were then tasked with purifing the bell, book, and candle. Comments Off on The Bell, the Book, and the Candle – The Story of The Shadow so Far….